All this time I thought it would be posthumously, if at all. For the last few years there has been a simmering campaign to get Walter Koenig a star on the Hollywood Walk of Fame. 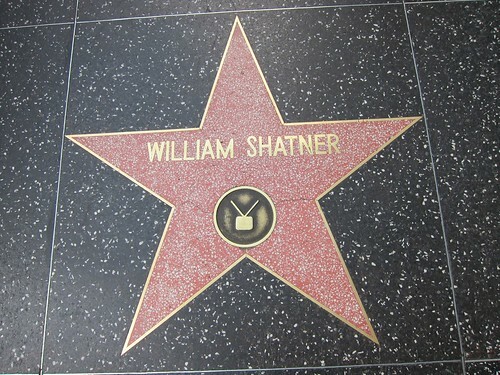 He was the last remaining main cast member of the original Star Trek who had not yet received this honor. His official site even has a page dedicated to the campaign. And there was even a viral video made to help out. Viral video supporting Walter’s Star using clip from Star Trek: New Voyage’s "To Serve All My Days"
Today The Hollywood Chamber of Commerce finally filled out their Star Trek set, by including Koenig on their list of 2012 honorees. In addition to Koenig, the list of 25 new honorees includes Star Trek: Generation’s Malcolm McDowell, Batman’s Adam West, recording artists Boyz II Men and Simpson’s creator Matt Groening. No date is set yet for Walter to get his star but he and the other recipients have five years to schedule ceremonies. When it happens TrekMovie.com will be there for all the fun. Congrats to Walter on getting his star! Walter Koenig as Chekov in Star Trek’s "Spectre of the Gun"
If you want to visit the original Star Trek stars on the Hollywood Walk of Fame, here is where you can find them. Leonard Nimoy 6651 Hollywood Blvd. George Takei 6681 Hollywood Blvd. So far the only post-TOS Star Trek actors with a star are Star Trek: The Next Generation’s Patrick Stewart (7021 Hollywood Blvd) and LeVar Burton (7000 Hollywood Blvd). And recently the Westmore family, who did the makeup for the Next Gen era, were honored with a star at 1645 Vine Street. Now Trek fans can move on to help fill out the TNG stars and beyond. What about Whoopi Goldberg? I’d thought she’d have a star by now. Fantastic news! Congrats, Walter! Long overdue. Walter Koenig really deserves this. Not just for his career, but also in light of his son Andrew’s suicide. Somewhere Walter’s son is smiling down upon him. Awesome news! ‘ bout time! And a big bat- shout out to Adam West as well! Great to have these deserving artists finally on the walk of fame. Mr. Koenig struck me as a really thoughtful and funny guy when I got a chance to talk to him one on one for about ten minutes at a convention. Congratulations. Congratulations Mr. Koenig; it is very well deserved. Yes, about time that Walter Koenig gets his Hollywood Walk of Fame star thus completing the entire original Star Trek cast. Batman Adam West will also get his as well as the Batman TV series is timeless. Congrats to both Walter and Adam. O U T S T A N D I N G ! ! ! George Takei — take notes — this guy does it all the right way!!! Long overdue! Congratulations, Walter. I just rewatched all the seasons of Babylon 5 and you were often a highlight of that series for me. Congrats Walter!! It’s about time! That’s was something that took way too long, I’m glad he finally got it. A couple of years ago, I took the time to place a comment on over 7,000 of my MySpace friends’ pages. I had asked them to write a letter on Walter Koenig’s behalf to request that he receive a star on the Hollywood Walk of Fame. There was an overwhelming positive response to me from my friends who were willing to do this for Walter. Walter has always been so very nice to all of his fans. I am proud of everyone who took the time to make it so for Walter Koenig. Finally! It should have happened sooner, so more people could have lived to see it. I wish Grace Lee Whitney had been on the show for a least a whole season. If they’d kept her character as prominent as she was, in the episodes she was in, she’d be at least equal to the other regulars. All I have to say is. It’s about time Walter got his Star. He is a great Actor and he deserves it. Finally, all the “magnificent seven” have their star on the Hollywood Walk of Fame. Hooray and congratulations to Walter Koenig! Not before time. Well done Walter and anyone who supported him! Walter is one of the most gifted of the original cast members. The man is a capable actor and a superb writer. I am very happy for him, particularly after his confession on Shatner’s Raw Nerve of feeling he was simply riding along the Trek wave all of these years. Walter deserves formal recognition for the talent he is. Congratulations! This is fantastic news! Well done, Walter! About damn time! Congratulations, Mr. Koenig. And happy birthday, Tim Russ! Congrats to Walter, Malcolm and Adam. Congratulations to the 23rd century’s most Russian navigator, and most ruthless Psi Cop! Good news! Congratulations Walter for getting the recognition you deserve. Funny posthumously remark. I’ve always said Keonig ( and Doohan) two most underrated of the show. Lot more depth there that we didn’t see. Good for him. Congratulations, man. Glad it finally happened. Agreed. Keonig & Doohan very good & underrated on the show. As for” Oh My Takei”…………………………(rest of post deleted as was full of vulgarities).